UPDATE: ALL AVAILABLE WORKSHOP SLOTS HAVE NOW BEEN FILLED. 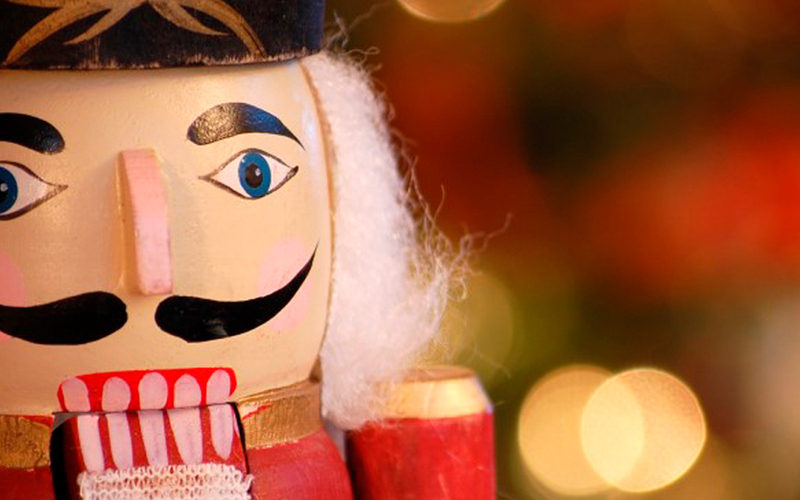 Join us this December for a sparkling new version of Christmas favourite The Nutcracker, and our version is for boys every bit as much as it’s for girls! Adapted by Guy Le Jeune from the folk tales of ETA Hoffman and Alexandre Dumas and directed by choreographer Jessica Peoples of ZoNa dance, our Nutcracker is set in Donegal and brings exciting drama and dialogue to the show while retaining some of the ballet version’s more famous dance pieces, and we think your students will love it. Like last year’s production of Peter Pan, this will be a youth led cast ages 8 to 21 and with 30 acting roles and 26 dancers it’s going to be huge! In addition, we are supporting the show with in-school movement workshops which are available free of charge and will be taught by our show’s director Jessica Peoples. The workshops will take place in October or November and will include movement theatre and dance suitable for boys and girls and will explore one of the scenes of the Nutcracker where the Nutcracker soldier meets his nemesis… The Mouse King! We expect these workshops to be filled pretty quickly so to schedule one for your class please contact Jessica directly on 086 8222189 or by eMail. Tues 12 to Friday 15 December at 11am. Sat 16 at 2pm and 7pm. Special rate for schools: €8, teachers/SNAs are free. Book now on 0749120777. The Nutcracker is produced by An Grianán Theatre in association with ZoNa Dance Co.
We were delighted to welcome some of our favourite people – Jym and Chantal from Fidget Feet and Little John Nee to An Grianán for a week’s residency in April as they worked on their brand new show Bingo Wings which is due to make its debut in 2018. They spend the week visiting day centres, swapping stories and playing bingo – not a bad way to spend a week! They also introduced members of our youth theatre to the joys of the bingo! An Grianán Youth Theatre members Amybeth, Eoin, Ryan, Jasper and Laramie with Chantal McCormick from Fidget Feet at a workshop in April 2017. The workshop is part of the research work for a brand new show called Bingo Wings which Fidget Feet are making with Little John Nee. Watch out for it in 2018. An Grianán Youth Theatre members Amybeth, Eoin, Evin, Darragh, Oscar, Emory, Ryan, Jasper and Laramie with Chantal McCormick from Fidget Feet at a workshop in April 2017. Little John Nee and Chantal McCormick playing bingo – it’s work! Honest! Little John performing at one of the day centres they visited as part of the research week for Bingo Wings. This research was supported by the Arts Council and 5 regional venues: Lime Tree Theatre Limerick, Town Hall Theatre Galway, Hawk’s Well Theatre Sligo, An Grianan Theatre Letterkenny and Backstage Theatre Longford. Our Radio Short Waves writing course reached its conclusion on Thursday 15 December with a showcase performed to an invited audience of family and friends. Facilitated by playwright Tara McKevitt our group of 9 writers have been working since September on these short radio plays, each approximately 10 minutes in duration. Our Radio Short Waves cast: Fionn Robinson, Orlaith Gilchreest, Valerie Bryce and John D Ruddy. John Logue was born in Derry, and has lived in Letterkenny for the past 30 years. He is married to Siobhan, and has two children, John F and Ali. John is a cabinet maker by trade, and a former Gaelic and Rugby footballer. He is currently Captain of Portsalon Golf Club. During the winter months he likes to enroll in night classes that challenge him. This Radio Play is his latest endeavour. Marie Kelly has previously undertaken Creative Writing courses with Denise Blake, Ronan Carr and Patrick Kearney. She also has an interest in drama and has taken part in productions with Worklab, Bread and Roses, An Grianan Theatre, and An Grianan Actor’s Studio. This is her first radio drama. Michael Leddy, originally from Leitrim, has lived in Donegal since 1999. He has been writing and acting on stage, and short films for thirty years. He collects various Old Time Radio shows from American radio, as well as Marvel Comics and rare, hard-to-find TV series. He wrote and directed a short film in 2013 Firefall. He previously had two short stories broadcast by RTE in the 90s. This is his first script for radio. Edwin Masterson is from Northern Ireland and started writing with the Derry rehabilita- tion writers group after recovering from a serious illness. He is now an active member of Scribophile.com. An avid film aficionado and poetry enthusiast, he recently finished the NaNoWriMo challenge in November. He has previously completed an advanced course in scriptwriting at the Letterkenny Culture Centre as well as an International literary course at the L.Y.I.T. Averil Meehan writes radio drama, poetry and fiction. Her radio play, “A Family Christmas” was broadcast twice by RTE. Her poetry collection, “Until Stones Blossom” is published by Summer Palace Press. Her writing has been published in literary journals and placed in various writing competi- tions. Pauric Gallagher has been performing stand-up comedy all over Ireland since October 2013. He was a finalist in Forbidden Fruit Comedy Compe tition in 2015 and has played support for such names as Gearoid Farrelly, Pat McDonnell and Andrew Maxwell. He has recently returned from a tour of Canada. He is also a long standing mem- ber of the Diamond Writers group based in Raphoe and was a writer and director on the AyeTV1 webseries ‘Letterkenny People’. Fergal Lonergan is a 16 year old nerd in 5th year in St. Eunans College. He first got into theatre with Letterkenny Youth Theatre and is focusing on comedy, writing sketches and directing for youth theatre the most notable being a stage adaptation of Blackadder. Fergal performs stand-up regularly, mainly in the Voodoo Vintage. After the Leaving Cert, he’s hopes to go on to study thea- tre and media, and eventually end up doing something in entertainment, be it comedy or writing weird, precipitation-based tragedies. Meg Grehan is a writer and stage manager originally from Louth and now living in Letterkenny with too many pets, all with ridiculous names (Starbuck, Ororo, Catgar and Doctor George O’Malley). Likes include cake and pink things. Dislikes include the patriarchy and going outside. Meg’s first book The Space Between will be published in 2017 by Little Island. Radio Short Waves course facilitator Tara McKevitt with its youngest participant Fergal Lonergan. A member of our youth theatre, Fergal was given a bursary by An Grianán to attend the course. Tara McKevitt is from Moville, and has written for stage and radio, including RTE Radio 1, the Abbey Theatre, and Traverse Theatre. She has facilitated workshops in Higher Education, (NUIG VEC Galway), Youth Groups, Schools, Prisons, as well as various other community groups. Project kindly supported by the Donegal County Council Arts Office. 12 Days of An Grianán: day 4 the pbm Summer School! Today’s offer is a fabulous 20% off our very popular pbm Performing Arts Summer School! That means you save a whopping €24! The pbm summer school is a brilliant one week intensive course in all things musical theatre! From 10am to 4pm every day, participants between the ages of 9 to 21 sing, dance, act and learn about stage craft from a team of seasoned theatre professionals. Then at the end of the week they perform in one of Paul Boyd’s hit musicals. This summer the school will be working towards Paul’s brilliant retelling of Alice’s Adventures in Wonderland in an uptempo, upbeat version of the Lewis Carroll classic. The pbm Performing Arts Summer School is on Mon 10 to Sat 15 August 2015. Book now! The pbm Performing Arts Summer School is back! The pbm Performing Arts Summer School is back this August, running Mon 11 to Sat 16. Participants will enjoy six days of intensive workshops in singing, dancing and acting culminating in a performance of the hit musical Pinocchio, working alongside full time theatre practioners in a professional theatre environment. The summer school is presented by pbm, one of the most acclaimed producers and creators of original musical theatre in Ireland and the company’s shows have now featured at theatres all across the world. Every year pbm offers young people interested in musical theatre the opportunity to work with the company’s creative team in rehearsals, learning about acting, singing, and dancing, and working towards a public performance of a very special version of one of pbm’s hit shows. This year’s show is the TMA award nominated Pinocchio – with wonderful characters, big laughs, and unforgettable musical numbers, this is a great show for all aspiring actors, dancers and performers. Previous participants have ranged from those interested in appearing in their first musical to those heading off to train at drama school – the company always tailors its work to meet the training needs of those who take part. The school costs €120 for the week and you can book now on 0749120777 or online here. Our next drama course for children starts on Saturday 26 April and is now open for booking. Our classes are suitable for children 7 to 13 years old and beginners are always welcome! At An Grianán Theatre our emphasis is firmly on creative play. Our classes feature an inventive and fun mix of drama games and exercises, voice work, movement and basic stage craft. Children are encourage to improvise and creatively engage with the material provided by our tutor Nora Kavanagh. The course will run for 10 weeks every Saturday until the end of June. You can book over the phone by calling us on 074 912 0777 or book online here. Our current drama course reaches its conclusion this Sat 12 April. We are holding an open house starting with a viewed rehearsal of the Grimm fairytale Fearless John on stage with the 7 to 9 year old group. From 11.15am the 10 to 13 year old class will perform rehearsed readings of short plays on the stage and in the upper and lower foyers. Events in the auditorium will finish no later than 1pm to allow the stage to be prepared for our evening show by Ruby Wax. An Grianán Theatre in association with the Earagail Arts Festival is launching a new community theatre drama training project on Wednesday evenings, 6:30pm to 9pm. The first session will be on Wednesday 9 April. Sessions will be facilitated by actor/director Sean Donegan and dance/drama facilitator Aoife Toner. The sessions will consist of an introduction to basic acting technique and classes will be suitable for beginners but should also be engaging for performers with a bit more experience. Participants in these classes may be invited to perform in a large-scale community theatre production in July which will be one of the highlights of the Earagail Arts Festival programme. Performances are scheduled for An Grianán Theatre from 12 – 15 July. Fiesta is a celebration of the dancers, the chancers and the lovers who graced the Fiesta Ballroom, Letterkenny – the famous dancehall venue that formed a hugely important part of the social history of Donegal and the wider North West region. Fiesta will be one of the theatre highlights of this year’s 26th Earagail Arts Festival (12-26 July 2014). The play will require a ‘chorus’ of actors to play the crowds attending the dance, so there will be some training given in the various dance forms that would have been seen in the Fiesta over the years. Actors in the chorus may also have some small amounts of dialogue. This should be submitted by Monday 31st March at 5pm. From those who apply a group of 24 people will be selected to attend on Wed 9 April. If you know someone you think might like to get involved – tell them about the project as well. Please note that the show will also feature a number of experienced performers playing the main roles. Auditions for these roles will take place after Easter, more information to follow. Fiesta is a new drama commission co-produced by Earagail Arts Festival, An Grianán Theatre and Donegal County Council Arts Office and supported by the Arts Council of Ireland, Failte Ireland and Donegal County Council.